"Yeah, there’s been some flubs. I mean, I made mistakes. You try to own it, you embrace it. Hell, I’m not perfect, I’ve certainly had my fair share of mistakes on live television and more than anything else you try to embrace it, you laugh at it, you smile at it, I had the remark on Twitter that you don’t try to deny it." It’s no secret that former Dallas Cowboys Pro Bowl tight end Jason Witten has struggled in his rookie season as ESPN’s lead analyst for Monday Night Football. Witten went straight from the Cowboys to the ESPN booth in an all-new broadcast team alongside Joe Tessitore and Booger McFarland. Witten has been criticized for his work and has had a few notable flubs, like saying Aaron Rodgers “pulled a rabbit out of his head.” Witten’s hire certainly hasn’t panned out for ESPN the way that CBS’s gamble did in inserting Tony Romo into their lead booth with Jim Nantz immediately after his playing days were over. And with each passing week, it only seems like the microscope on Witten’s work is intensifying. It’s even gotten to the point where the broadcasters themselves were asked about the progress of the new MNF announcing team on ESPN’s Monday Night Football conference call this week. Play-by-play man Tessitore talked about the group trying to improve every week and increase the cohesion in conversation, which is certainly a challenge given McFarland’s remote location on the sidelines. But perhaps the most notable quote was Witten himself commenting on his rookie season and honestly addressing the mistakes and the criticism directed towards his rookie year. Q. Jason, you’ve been self-deprecating about some of the mistakes and flubs you’ve made as a rookie broadcaster. What do you say to the critics who have said you’ve struggled on the air this season and what do you think you need to do to get better? WITTEN: Yeah, there’s been some flubs. I mean, I made mistakes. You try to own it, you embrace it. Hell, I’m not perfect, I’ve certainly had my fair share of mistakes on live television and more than anything else you try to embrace it, you laugh at it, you smile at it, I had the remark on Twitter that you don’t try to deny it. You know, I got a few texts from my wife and it’s good to see her laughing at it when I get home the next day and talking about it. So it’s a transition, I try not to take it too serious, I really try to embrace it, and focus on improving. I understood when I took this job that it was going to be hard, it was going to be a transition. Certainly with Tony and the success that he had, I really try not to live in that world and fully embrace it and continue to get better and evaluate it, but I think with the flubs I certainly do not deny it, I don’t try to hide it and as you said, that’s really all you can do in those moments is self-deprecate and move forward. So over time I hope to improve and get better at it, but yeah, that’s kind of my approach with it. It’s one thing to admit mistakes and embrace them, but it’s another subject altogether to wonder what ESPN is going to do about it if it continues. The network placed a huge bet on Witten being able to duplicate his former teammate Romo’s success (and it’s fascinating that Witten himself makes that connection) and it hasn’t come to fruition. In truth, how could that be a fair expectation? Romo’s seamless transition from playing field to top broadcast booth was something we really haven’t seen before in the industry. If anything, Witten’s introduction to Monday Night Football has been more like Fox’s experiment with Gus Johnson calling soccer games. Everyone loves Johnson’s enthusiasm and he’s a cult favorite calling college basketball and football. But it just didn’t work in soccer. Even though Fox proclaimed Johnson would carry the network’s coverage into the World Cup, they eventually chose to move in a different direction with more experienced soccer announcers like John Strong and J.P. Dellacamera. With Witten, the same is true as it was with Johnson. ESPN could have had him serve a year calling college games and learning the craft and even seeing if he was really cut out to be a lead announcer for Monday Night Football. In that environment, he could have learned on the job without the pressure of the huge spotlight and the huge paycheck. ESPN has a number of analysts on their roster already that they could have plugged in to replace Jon Gruden, even if it was just for a year, with more experience calling games. 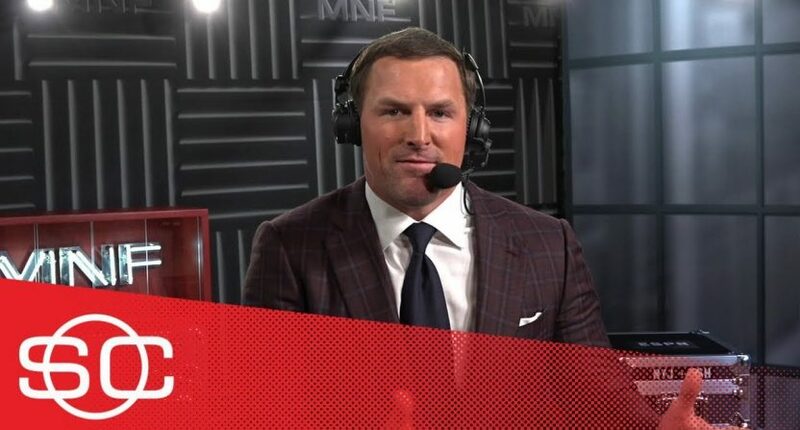 Instead they took the gamble to plug him into an experimental MNF booth and let him sink or swim right out of the gate. And so far it’s been too much sinking and not enough swimming. The question is how patient ESPN can be until either Witten improves and the entire booth gels together or a change needs to be made.